Ideal Credit Union has relaunched its don’t text and drive awareness campaign designed to call attention to the dangers of distracted driving and encourage the public to take a pledge to put the phone away when they get behind the wheel. Ideal CU has relaunched a don't text and drive awareness campaign in honor of employee David Riggs, who was hit by a distracted driver in August of 2013. Ideal Credit Union has relaunched its don’t text and drive awareness campaign designed to call attention to the dangers of distracted driving and encourage the public to take a pledge to put the phone away when they get behind the wheel. The “Stop the Texts, Stop the Wrecks” campaign consists of 15 and 30 second TV ads on Twin Cities stations WCCO and KARE, an online pledge at idealcu.com/pledge, and efforts to increase awareness through its social media channels. The two ads can also be found on Ideal CU’s YouTube page. By taking the pledge, drivers agree to not text while operating a vehicle, keep their eyes on the road at all times and encourage others to help end distracted driving. Ideal conducted the first don’t text and drive awareness campaign in September of 2016 in honor of one of its employees, David Riggs, who was hit by a distracted driver in August of 2013 and died 4 days later. 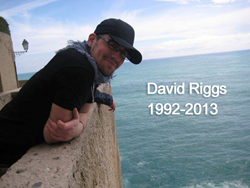 The accident took place right in front of the Riggs home as 20-year-old David was waiting to turn into his driveway. David’s older brothers Mike and Matt are featured in the don’t text and drive awareness ads. The texting awareness television ads will run through the month of August. Ideal will hold a balloon release in honor of David during the Community Appreciation Week celebration in North St. Paul on August 17th from 10:30-11:30 a.m. Governor Mark Dayton has issued a proclamation making August 17, 2017 “David Riggs Distracted Driving Awareness Day” in the state of Minnesota. In 2015, distracted driving contributed to 174 serious injuries and 74 deaths, up from 61 deaths in 2014 according to the Minnesota Department of Public Safety. From 2011 – 2015, 326 people lost their lives and 1,076 people suffered life-changing injuries in distracted driving-related crashes. That compares with 350 fatalities and 1,511 life-changing injuries from 2006 – 2010. In Minnesota, it is illegal for drivers to read, compose or send texts and emails, and go online while the vehicle is in motion or a part of traffic. This includes sitting at a stoplight or stop sign or stopped in traffic. It also is illegal for drivers with a permit or provisional driver’s license to use a cell phone while driving, except for emergencies to call 911. Minnesota law states drivers face a $50 fine, plus court fees, for a first offense. They’ll pay an additional $225 fine (for a total of $275), plus court fees, for second and subsequent violations of the texting-while-driving law. The Riggs family is working to strengthen legislation and penalties for distracted driving and has actively lobbied for increased awareness of the dangers and consequences caused by this growing epidemic. Founded in 1926, Ideal Credit Union is a member owned financial institution that specializes in providing excellent member service, great rates and convenience to over 50,000 members. Ideal CU offers a complete range of services, including a full suite of electronic banking products, savings, checking, loans, mortgage products and title services, exclusive VIP member payback, business services, investment services and more. Offices are located in Eagan, Hugo, Inver Grove Heights, North St. Paul, Stillwater and Woodbury. Visit idealcu.com for details and directions.